Imām Ibn Mulaqqin (723-804 AH) is a famous ĥadīth master and Shāfiýī jurist. This book contains a list of terms used in ĥadīth sciences, which he summarised from his two-volume work on ĥadīth principles named: Al-Muqniý fī Úlūm al-Ĥadīth. It is a quick reference. I have added a few footnotes and examples to make it easy for people like myself. Download here : Tadhkirah of ibn mulaqqin. This is a bird's eye-view of the 30 volume fatawa; including monographs in each volume. This poster is made for A2 size (but can scale to A1 or lower, though at A4, monographs are barely readable). 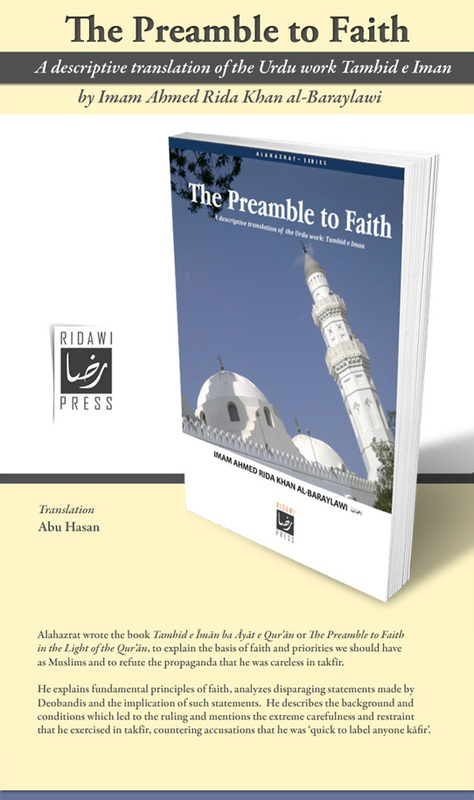 Book Release : The Preamble to Faith : Tamhid e Iman - Translated. as Muslims and to refute the propaganda that he was careless in takfīr. that he exercised in takfīr, countering accusations that he was ‘quick to label anyone kāfir’. 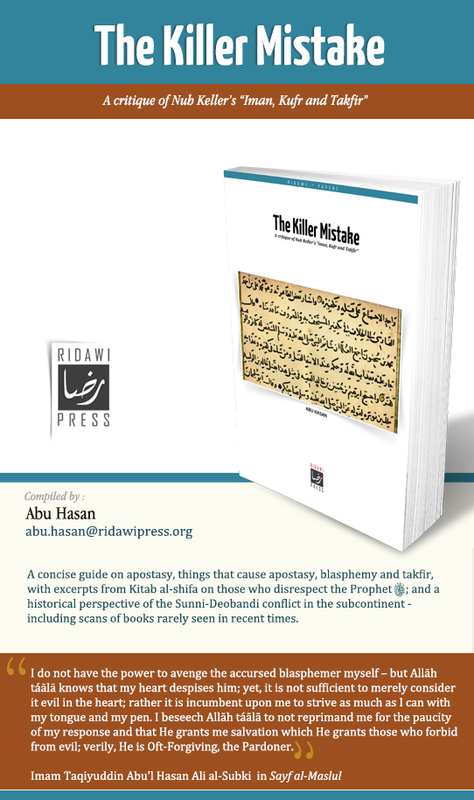 A critique of Nuh Keller's "Iman, Kufr and Takfir"
Apart from being a critique of the said article this work is alHamdulillah a concise guide on apostasy, things that cause apostasy, blasphemy and takfir, with excerpts from Kitab al-shifa on those who disrespect the Prophet sallallahu alayhi wa sallam ; and a historical perspective of the Sunni-Deobandi conflict in the subcontinent - including scans of books rarely seen in recent times.